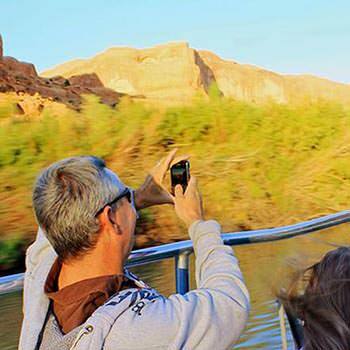 "Stunning sunset boat ride on the Colorado River"
We decided to get an up close view of the Colorado River and booked a jet boat ride. We were not disappointed and loved looking up at the canyon walls. Our guide and captain was very informative while also entertaining. The ride takes about 1 1/2 hours and is family friendly. We went for the evening ride and brought jackets as it can get cool in the fall. The boat also had blankets if you needed them. The boat goes fast but we certainly felt safe. You will also see petroglyphs and might see mountain climbers and wildlife. They do offer a dinner trip during the summer months but not in mid-October. We were charged $79 and were a little disappointed that there was no discount for seniors even though there was a youth discount. The trip was well organized and the tour guide was enthusiastic and you could see that he liked his job.